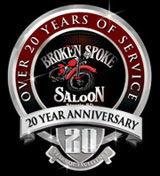 brokenspokesaloon: The Original Broken Spoke Saloon! Sturgis Rally 2011! The Original Broken Spoke Saloon! Sturgis Rally 2011! The Original Broken Spoke Saloon is. . . The hottest honky-tonk in downtown Sturgis! STURGIS, SOUTH DAKOTA – August 4, 2011 - The Original Broken Spoke Saloon on Lazelle Street is a down home, honky-tonk party that is on fire the entire 71st rally week. With its ride through bar, tire burned dance floor, museum quality motorcycles and collectibles, and non-stop entertainment it’s where the real rider loves to hang out. This year, Jay Allen hosts several must-see adrenaline-fueled experiences: Cycle Source Magazine Night, the 6th with editor and Limpnickie Lot founder, Chris Callen and friends; Michael Lichter/Sugar Bear adventure ride, the 7th where riders are photographed by an Easyriders Magazine legend. 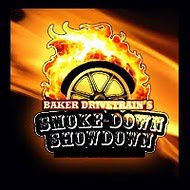 Baker Smoke Down Showdown on Monday showcases hot, young custom builders in head-to-head tire blazin’ competition and on Tuesday the customer gets to smoke down their rides for awards. 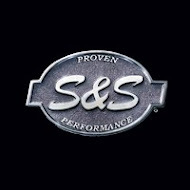 AHDRA top fuel bikes light it up live on the dance floor Tuesday and industry legends seize the S&S Smokeout burnin’ spotlight, Wednesday, with one lucky customer winning an S&S Cycles 113” engine. Music is an essential ingredient that creates truly magical memories at the ol’ Spoke. Biker rock stars commanding the stage are Jasmine Cain, Ryan Rolando, Big Engine, Farrell Webber, including excellent tribute bands. “In our culture, we have our own music stars on the rally circuit that entertain the rally customer in a way that is completely different than other artists and we serve up this musical cocktail better than anyplace else in Sturgis. Their performances celebrate the rider spirit and our incredible lifestyle. They rock hard and deliver a show that keeps the audiences wanting more,” says Mr. Allen the consummate party host. Jasmine Cain celebrates the release of her new album Highway Prophet on Saturday the 8th with local artists and surprise guests coming to jam all night. Two new additions inside the Broken Spoke were born from their successes at last year’s rally: Jasmine Cain’s Traveling Tattoo Company, featuring award-winning tattoo artists, and Angel’s Smokin’ Joe Café offering the best coffee drinks around using Sturgis Coffee Company products. The open yard will be packed with carni-style entertainment, an Italian kitchen, and other unique vendors. Paul Cox, builder to the stars and sidekick to legendary Indian Larry, will be on site at the Seminole Hard Rock lounge. Debuting on Wednesday this year is the exciting Original Broken Spoke Saloon Ride-In Old School Chopper Show where customer’s bikes receive awards and accolades, all in Jay Allen’s unique hosting style. Winners ride away with a prize award and the customers receive entertaining motorcycle history from Jay. Another source of Mr. Allen’s enthusiasm and passion for sharing the love of motorcycles is his dedication to racing. 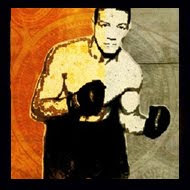 He is also the captain of the Broken Spoke Race team and a record-breaking monster Bonneville Salt Flat racer. The Original Broken Spoke Saloon will always be home to the most authentic rider of all ages. The atmosphere simply caters to a rider’s soul. From great entertainment, to great food and overall service, “We are all about showing love to our customers,” tells Jay. This year, that love will be captured on film for a hot new television show, details to be revealed at a future date. All events are free to attend.